This section contains settings related to bent normal. Toggles ray-traced bent normals calculation on and off. 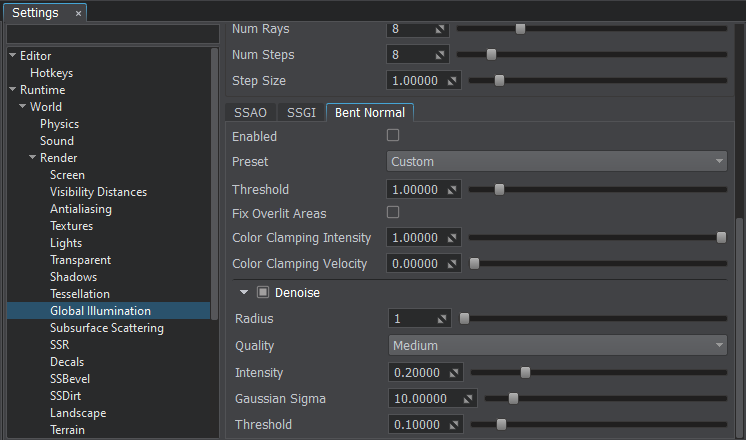 The use of SSRTGI for bent normals allows for smooth ambient lighting on objects junctions. Ray-traced bent normals calculation available only when the SSRTGI technique is enabled (Rendering -> Features -> SSRTGI). Enables or disables noise reduction for ray-traced bent normals calculation. This option reduces noise by using the blur effect. Limits ray-traced bent normals calculation in areas where SSRTGI cannot get information.